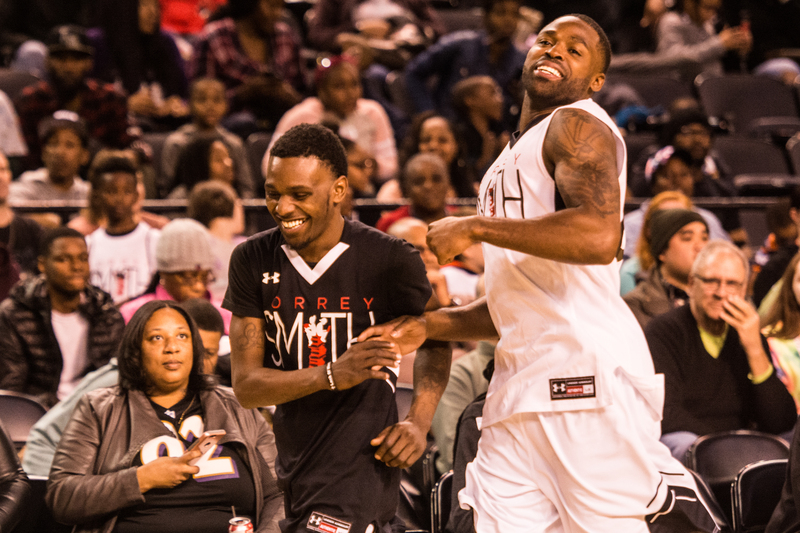 BALTIMORE — When spectators arrived at Royal Farms Arena on March 17 for Carolina Panthers receiver Torrey Smith’s annual charity basketball game, they likely expected to see some of their favorite NFL players try their hand at basketball, maybe a few dunks, and overall just have a good time while supporting a good cause. What they received, though, was a March Madness-type atmosphere in the winding seconds of a game featuring a former highly ranked basketball recruit, a Maryland politician and a former member of a boy band. 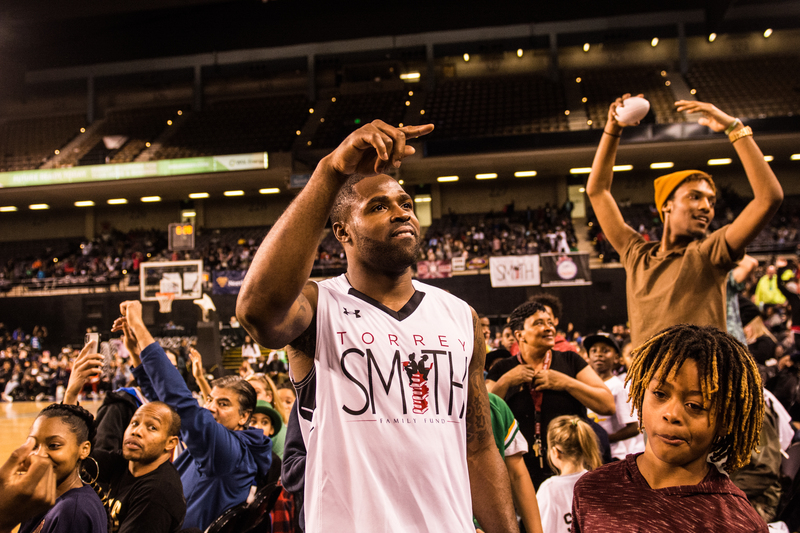 The Black Team edged Smith’s White Team 105-100 at the seventh annual Torrey Smith Family Fund Charity Basketball Game, capping a night dedicated to community, education, and fostering safe and rewarding environments for children. The game was billed as a “day of fun for the entire family,” building off Smith’s foundation’s mission “to provide youth with the tools they need to identify, unleash, and reach their full potential.” And even though Smith, who was traded from the Philadelphia Eagles to the Panthers earlier this month, hasn’t played for the Baltimore Ravens since 2014, he’s made it a point to keep the event in a city that’s meant so much to him and his family over the years. “The heart of our efforts are right here in the city,” he said before the game. “It’s a great way for the community to get together and watch some of their favorite athletes. Through his organization, Smith provides college scholarships, holds holiday drives and goes into schools to help mentor students and build the communal foundation necessary to raise underserved children. Smith, a member of the social justice-centered Players Coalition alongside about 30 other NFL players, also focuses on criminal justice reform as one of his major platforms, lobbying for legislation that seeks to dismantle mass incarceration rates. He’s advocated for the release of Philadelphia-born rapper Meek Mill, a source of inspiration for the Super Bowl champion Eagles last season. Mill was sentenced in November to two to four years in state prison for violating his probation. Even with the Eagles’ Super Bowl (which Smith believes won’t be the team’s last title, even though the salary cap will soon be an issue: “They’re taking full advantage of not having to pay a QB right now because when Carson [Wentz]’s time comes, you’re going to need a Brinks truck the size of this arena for him.”) and the upcoming move to North Carolina (“I am excited about it. It’s a new opportunity. I understand the business. It wasn’t a situation where I was, like, blindsided or anything like that.”), community events such as the charity game are the most rewarding experiences. Smith wanted the game to be a “fun raiser” that would give fans a chance to “watch some guys embarrass themselves.” And that they did. 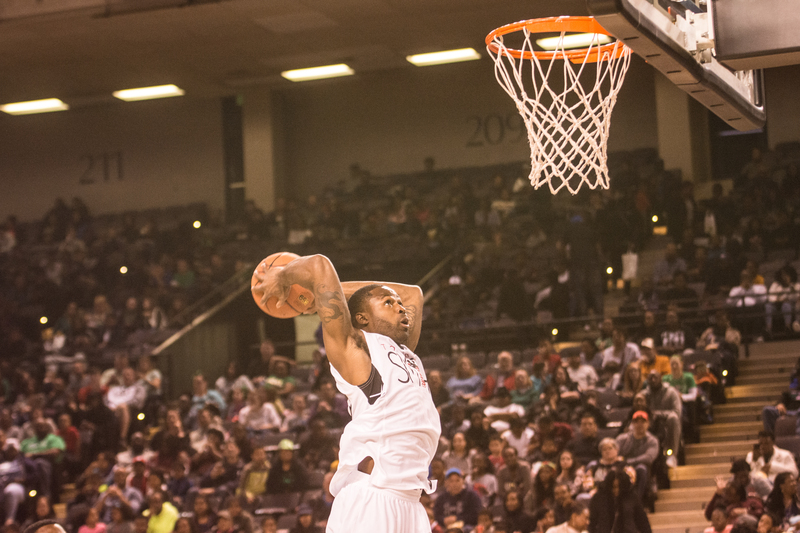 Torrey Smith rises for a two-hand dunk in the second half. Before tipoff, some of the NFL players had high expectations (maybe too high) for how their skills would translate from the gridiron to the hardwood. White Team member and Philadelphia Eagles receiver Rashard Davis, Smith’s teammate last season with the Eagles, said after dropping a “smooth” eight points and three assists two years ago that he looked to score 10 on Saturday on “straight layups, not shots.” Davis ended with five points in a losing effort. The Black Team’s Rasheed Bailey, a receiver on the Panthers, had higher aspirations, setting his floor at 30 points and the most valuable player award. He finished with six points. Former Ravens receiver Jacoby Jones, whose lone highlight was hitting the viral “shoot dance” during player introductions, may have been the worst player on the court, air-balling easy layups and nearly turning the ball over whenever he touched it. He did, however, go on to finish with a respectable six points. Smith, likely in charge of rosters, stacked the White Team in his favor with the better on-paper talent, including former Ravens teammates Anquan Boldin and Tyrod Taylor, and NFL receivers Bruce Ellington (Houston Texans) and Brandon Shippen (Kansas City Chiefs). 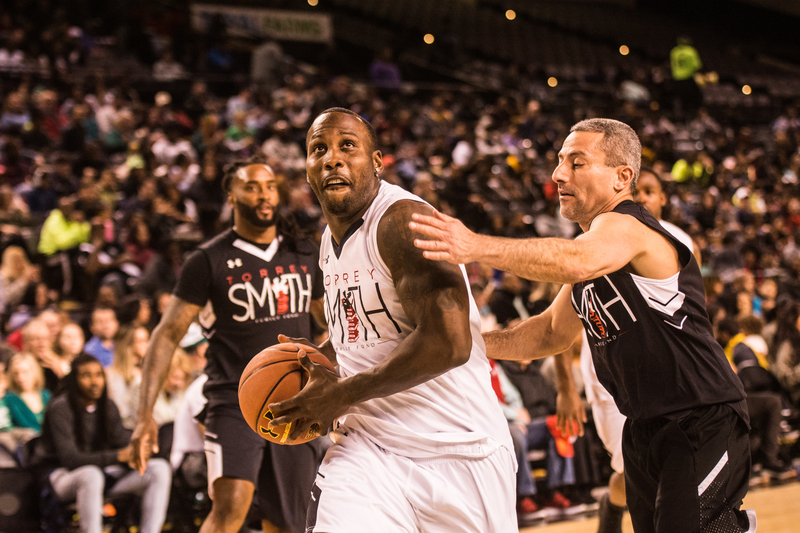 Meanwhile, Baltimore hoops legend Aquille “Crimestopper” Carr, a former Seton Hall recruit, had to carry a Black Team roster that included three NFL linebackers, singer/rapper Mechie and Maryland state Sen. Bobby Zirkin, who didn’t appear to attempt a single shot all night. Not choosing Carr, whose highlights on YouTube have amassed more than 8 million views, turned out to be Smith’s sole mistake when organizing the event, as the former Patterson High School star dazzled the crowd, almost making at least three defenders fall (Ellington was nearly a victim) with his Kyrie Irving-like handles and finishing ability. A push off and jumper over former Mindless Behavior member Craig “Prodigy” Crippen Jr. would’ve made Michael Jordan proud and elicited oohs and aahs from the crowd. Carr, who was listed at a generous 5 feet, 7 inches in high school, even stuffed a dunk attempt by the 6-foot Smith that electrified the entire arena. Carr finished with a game-high 38 points and was awarded MVP honors, much to the chagrin of Bailey. At halftime, Smith awarded college scholarships in memory of his late brother Tevin Jones to four local high school seniors. Afterward, there was a performance by the Lethal Ladies of the Baltimore Leadership School for Young Women, a Baltimore step team for young women and the subject of a recent Sundance documentary, Step. Torrey Smith interacts with fans late in the third quarter. After a back-and-forth contest through the first three quarters, business, as they say, picked up in the final minutes of the fourth. Carr scored a basket with just under two minutes left to put the Black Team up 100-96, but the White Team fought back to make it 102-100 with 20 seconds left and the ball in their possession. With nearly everyone in attendance on their feet, Smith got a wide-open look from behind the 3-point line that looked like it was going to go in, but it hit off the side of the basket. Down on the other side of the court, former Green Bay Packers receiver Antoine “Shaky” Smithson made his own 3-pointer for the Black Team.